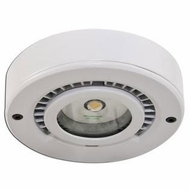 LED under cabinet lighting features 24 volt Kichler lighting fixtures made with three, six or nine LED warm lights that last up to 40,000 hours, and are built for flush mount, above cabinet or under cabinet applications. These modular lighting systems are designed to interconnect with one another, and are low voltage. In addition, the affordable under cabinet track lighting fixtures are guaranteed to add style and class to any home. While quality under cabinet track lighting fixtures are most commonly used in the kitchen, they can also be installed in a bathroom or even bedroom. In some cases, sale-priced under cabinet track lighting fixtures can also work well in an office or retail facility. Light your kitchen cabinets and save energy to boot, with LED under cabinet lighting. 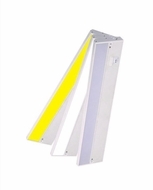 Customers who decide to buy LED cabinet lighting will not be disappointed with the purchase. In fact, after choosing between the best LED cabinet lighting fixtures below, you will agree that they are of the highest quality available. Individuals who have questions regarding the purchase of LED cabinet lighting fixtures should contact Affordable Lamps today.